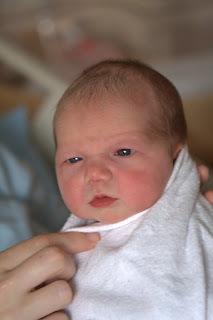 Quaint and Quirky: Amelia's Birth Story - Finally! Amelia's Birth Story - Finally! Amelia is doing GREAT after her hospital scare. She's back to her normal, feisty self! 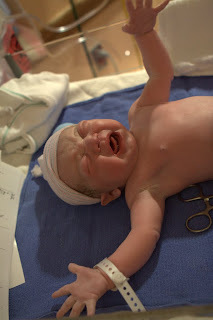 I finally got to writing down her birth story! Although I was convinced that Amelia was going to be a nice little girl and come out a week or two before her due date, she had other ideas. Her due date came and went without a sign of a contraction. Although I had been very calm about everything throughout the entire pregnancy, for some reason I became a lunatic at the end. It wasn't like a "I hate being pregnant" thing (because I didn't). I just had convinced myself that there would be some kind of problem from her being late (aged placenta, too big for the birth canal, etc.). I read too many blogs. One week past her due date, we went for a checkup ultrasound and non-stress test to check to make sure everything was okay. Everything was, but the doctor recommended an induction. "When?" I asked. "Tomorrow," replied the doctor. YIKES!! Seriously, the doctor I saw that day (who was not my doctor, but another one in the practice) said like 10 words the whole visit. She was not the most encouraging OB I've ever met, that's for sure! My mom, husband, me, and all of our pillows, clothes, snacks, ipods, baby book, camera equipment, laptops, cell phones, baby blankets, birth plan, going home outfit, peanut butter m&ms, etc. arrived at the hospital early on the Tuesday morning. They gave us a BIG room because I was going to be laboring there all day, not just delivering. They hooked me up to the pitocin and even though I was on the pitocin for hours and contractions were registering, I still never felt them. The day before, at the appointment, I had been 3 cm dilated and had never felt a contraction. Fine with me! Eventually I did begin to feel the contractions though, but I walked the hallways with the Tin Man and Josh (and my mom) to ward off the epidural. Gravity, baby, gravity! Soooo the pain got more acute. Dita gave more lessons. My husband failed the lesson on rubbing my back. Since I came in at 3 cm, and I had been in forced labor for like 7 hours, I figured I was at like 7, 8 cm. Right? Wrong. The doctor came in to check and I was at 4.5cm. I did some more walking, but I was really in pain at this point. My friend Kelli told me to pick a labor verse and recite it during every contraction. 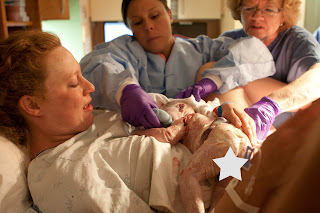 She said when she couldn't remember the verse anymore, it was time for the epidural. 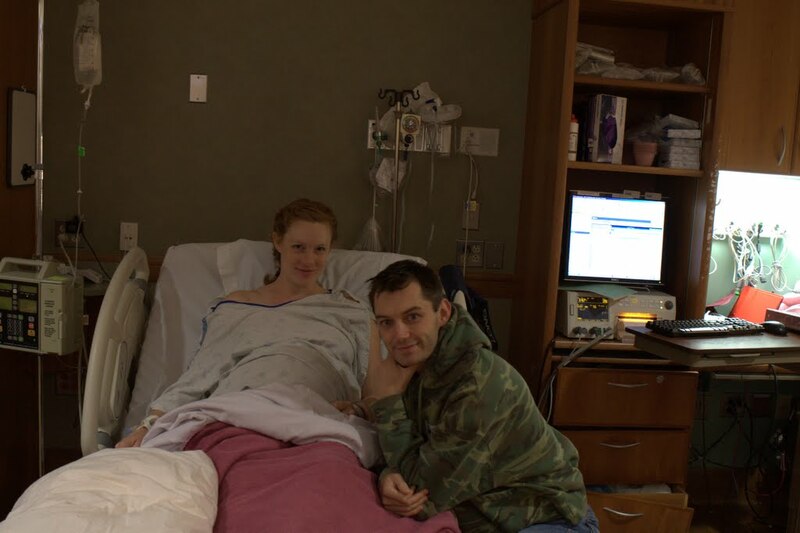 Okay, time for the epidural! Dita gave me a lesson on epidurals. I didn't hear a thing she said. The epidural man came in during a contraction and told me things that I didn't hear. They made me drink this liquid to soothe the stomach, but I have a hard time ingesting anything new, so I held my nose and chugged it down. Then when I released my nose, it tasted like grape Slush Puppie and I wanted another helping. Too bad, but they DID give me an epidural. It took effect right away and the pain totally went away. I took a nap. My mom and husband got something to eat. They came back, I woke up. Nooo paaaaaain! I loooooove epidurals!! My mom and Josh started to play a game of Scrabble on their ipods when the doctor came in. Time to check! Seven, eight centimeters? NO, TEN! Woo hoo! Time to meet the baby! Ipods went away, things got prepped. Dita had me give some trial pushes. Couldn't feel them, but I knew what I had to do. After a few practice pushes, the doc came in, sat in her fancy chair and I go t to really push. I did what every woman is afraid to do while pushing out her baby (if you know what I mean). My husband watched. I was impressed. He held things, like my leg, which to me may as well have been a tree trunk. Still couldn't feel a thing. About ten minutes of pushing went by and then...HEAD! The doctor said she didn't have hair, but she did. Five more minutes, then she was out. Her cord was wrapped around her neck, but not tightly. She was crying and looking around and blinking in the bright lights. They put her on me and she was SO WARM. That's what I said - "Hi Baby, Hi Baby, Hi Baby, You're so WARM!" Next up will be the nursing story. 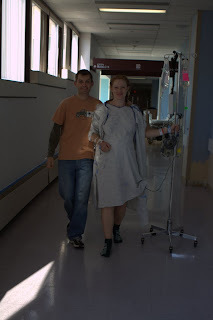 My nursing story is MUCH more complicated than my birth story! These are the times of your life- the most beautiful and memorable days. As a Grandmother, I will remind you that these times pass so quickly, so cherish each second- because in the blink of an eye, suddenly you're a Grandmother. Loved your story and all the pictures. Lovely post! What a gorgeous baby! You are blessed! Congratulations! You look too beautiful to be in labor...I love your hair!! And Amelia is so sweet! In the meantime, congrats and we'll give you time to rest. She is beautiful! Her name suits her and is lovely . Germanic meaning: work, effort, strain...(I guess so,huh mom ?) Hebrew (work of the Lord). May you all be blessed for surely she is a"hand made" work of the Lord. Love her! Thanks for sharing! So glad we were preg together & our babes are close in age! I love the way you write :) Great account of her beginning! 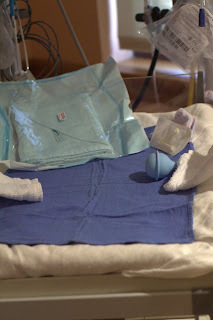 Stumbled upon your blog and could not resist reading about the birth of your little one. Sending prayers your way- what a sweet baby girl!